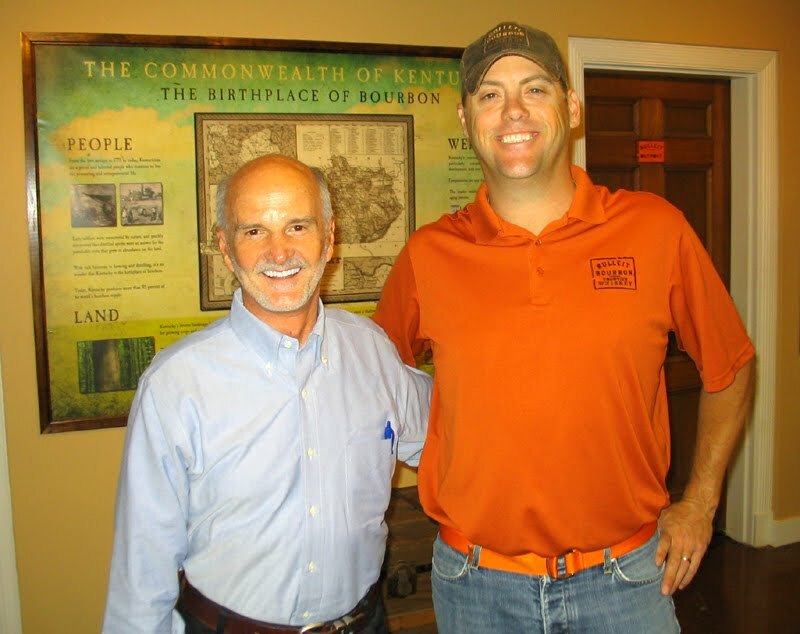 The Chuck Cowdery Blog: The Bulleit Experience At Stitzel-Weller Distillery. The Bulleit Experience At Stitzel-Weller Distillery. Several years ago at WhiskyFest Chicago, I was chatting with Chris Musumeci, then brand manager for Diageo's Bulleit Bourbon. We talked about the growth and popularity of the brand. "At some point," he said, "Bulleit will need some kind of home place." The distillery where it is made would be the natural home place but, as we both knew, Bulleit's products are contract distilled by non-Diageo distilleries. My comment was, "Well, there's always Stitzel-Weller." Stitzel-Weller is the old Van Winkle family distillery. Built in 1933, it operated until 1992. It was the home of Old Fitzgerald, W. L. Weller, Rebel Yell, Cabin Still, and Old Rip Van Winkle wheated bourbons. The company now known as Diageo has owned it since 1987. Last summer, it seemed as though they had taken my suggestion. "The Bulleit Experience at Stitzel-Weller Distillery" was announced with moderate fanfare. Industry people, including myself, were invited for previews. A few preview events were held. Mine was cancelled. Another visit was scheduled and cancelled earlier this year. Two weeks ago, I finally got to peak behind the curtain. The first pleasant surprise. There is a guard on the front gate again. In recent years, only the back gate has been used. 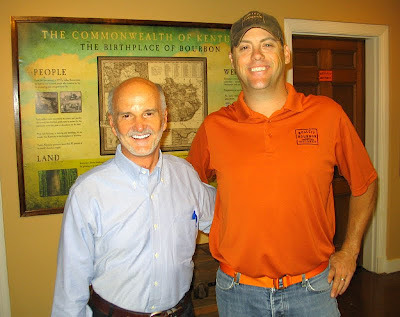 I was met by Tom Bulleit (left, in the photo) and Bobby Burke, who was introduced as the first tour guide. The focus of "The Bulleit Experience at Stitzel-Weller" is the old office building, whose design was based on Thomas Jefferson's home, Monticello. The effect of Southern gentility is enhanced by the large magnolia tree in front. To the right, there is a small gazebo. To the left is the first row of black-painted, steel clad aging warehouses. On the long side of each warehouse there is a raised concrete walkway covered by a low roof, giving it the look of a covered porch. Upright whiskey barrels and rocking chairs complete the effect. It is possible, therefore, to walk along the long side of each warehouse, protected from the elements, though still outside, and look into the open first floor windows, yet that's not part of the tour because of "insurance concerns." Instead, details of the office building's architecture are pointed out. Don't get me wrong, I love that sort of thing. Inside there is a vestibule with some benches. The next door leads to a large room with exhibits that tell the history of the distillery, of the Bulleit brand, and of Kentucky whiskey-making in general. There are a couple of barrels marking production milestones and other artifacts drawn from the distillery's vast archives. This central room has several doors. One leads to Tom Bulleit's office, which occupies a small portion of what was originally Pappy Van Winkle's vast office. It's a very handsome room. Another door leads to another now-subdivided part of Pappy's old office, that is decorated like a library. This is where the tastings will take place. This space has a large window that provides a nice look at the grounds. Then there's the gift shop. I had a very nice time with Tom and Bobby. I was just meeting Bobby but I've known Tom for years and always enjoy his company. As I told them, I think people will be disappointed if they can’t see a little more of the distillery, in particular the inside of a warehouse and at least an outside look at the old still house. If going inside isn't possible, then at least include a walk of the grounds pointing these things out. That's all there is anyway. No distilling or bottling is done there. I also don't know where people are going to park. They have maybe ten spaces in front of the office building and no place for buses. You wouldn't want to sully the grounds by laying more asphalt. These may be some of the reasons why the place isn't open to the public. Tom and Bobby say they don't know when it will open. It's not up to them. They did mention that recent road improvements make it easier to get there from Interstate 65, and the improved road takes the visitor past Papa John Stadium and Churchill Downs, where they might be going anyway. For now, they're just using it to host journalists and trade customers. They'd love to be on the official Kentucky Bourbon Trail and it would love to have them. As they also point out, Stitzel-Weller is an active maturation facility. As such, it is overseen by John Lunn, who is best known as Master Distiller at George Dickel. He was recently promoted to Southern Hub Director for Diageo. The Southern Hub is comprised of the Dickel and Stitzel-Weller sites. As Director, Lunn oversees daily operations and is responsible for production, quality and safety. Anchoring Bulleit at Stitzel-Weller is like anchoring Ripple at Chateau Lafite. Any word on whether anyone will ever start operations back up at this place? It'd be awesome for Louisville to have another distillery in town other than Brown-Forman. Seems unlikely but you never know. Diageo owns it and they have all the money in the world. Does anyone know how much a bottle of very very old Fitzgerald's Bourbon 18 years aged,distilled in 1951 and bottled in 1969 would be worth? I inherited it from my grandfather. It's still sealed and in mint condition.